Grammy-winning songwriter and Detroit native Allee Willis, a big-time character if there ever was one, who wrote such songs as "September," for Earth Wind and Fire, and the theme song for the TV show "Friends," will debut her song "The D" Thursday night during a free Detroit Institute of Arts party from 7-11 p.m. The song is performed by 5,000 Detroiters, the most people in history on a record, according to Willis. The song and accompanying micro-documentary includes 70 sing-alongs citywide, recorded over five years. An intro on the video says that the song is meant to serve as the "official unofficial theme song to accompany Detroit's rapid reinvention, a testament to the motto Willis lives by: From the ashes come the miracles." 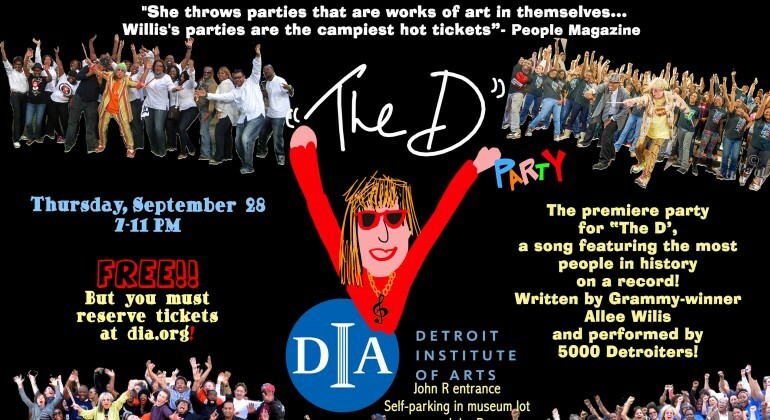 The DIA party features music, art games, food, cash bar and sing-alongs.